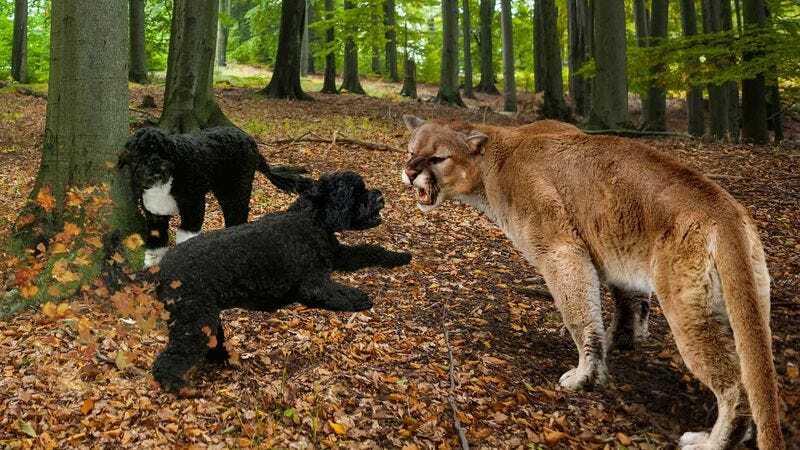 Bo’s encounter with the mountain lion was said to be the pair’s worst predicament since Sunny disastrously attempted to befriend a skunk several days earlier. GARDINER, MT—Fending off the large wildcat moments before it could harm her best friend, presidential pet Sunny reportedly saved fellow first dog Bo from a mountain lion attack last month as they journeyed across the country to find their way back to the Obama family. Sources said the White House’s two canine residents, who were accidentally left behind by the first family during a trip to Yellowstone National Park, encountered the mountain lion while making their way through the Montana wilderness. According to reports, Bo, who had become separated from his companion earlier in the day when he slid into a ravine, was cornered by the predator against a large tree trunk and seemed to have no means of escape until Sunny, having seemingly appeared out of nowhere, came rushing to his aid at the last possible second. Administration officials said the two Portuguese water dogs were mistakenly left in Yellowstone by the vacationing Obamas, who returned home believing Sunny and Bo had been loaded aboard Air Force One, never realizing the pair had scampered off the tarmac and into the woods moments before takeoff to chase a squirrel. It is believed that the dogs later returned to the spot where they had last scented Barack, Michelle, Malia, and Sasha Obama and, after sitting patiently overnight until realizing the family was not going to return, decided to find their way back to Washington, D.C. on their own, beginning a 2,000-mile journey eastward. The first pets reportedly spent the next few days bounding over mountain passes and wading through rocky streams, from which Bo would, after several fruitless attempts, emerge with a fish in his mouth, providing much-needed sustenance to the pair, who were accustomed to being fed nutritious meals at regular intervals by their White House handlers. Early on in their trek, Sunny and Bo are said to have encountered several hikers they thought might rescue them. However, the group turned out to be German tourists who, reportedly failing to recognize the presidential seal on the dogs’ collars, simply pet them, fed them some dried fruit, and continued on their way. According to sources, rarely a day of their adventure went by without the two dogs getting into a precarious situation that required them to rely on each other to get through. At one point, after traveling for a day without water, Sunny reportedly came upon a rushing river and, in her eagerness to take a drink, slipped on a rock, fell in, and was swept away by the powerful current. Bo is believed to have reached the river’s edge just in time to see Sunny’s head pop up and disappear around the bend. With neither dog having much swimming experience outside the White House pool, sources said a quick-thinking Bo ran downstream as fast as he could, grabbed one end of a long stick in his jaws, extended it out over the water, had Sunny bite down on the other end, and managed to pull her to safety just before she would have plunged over a waterfall. Cold and hungry as they crossed through barren, wintry terrain, the first dogs were reportedly found trudging through chest-deep snow by a kindly old man who let them stay for a time in his small and humble cabin, surroundings that were far removed from the accommodations that Sunny, who was purchased from a professional breeder, and Bo, who was a gift from the late Sen. Ted Kennedy (D-MA), were used to. According to reports, the old man allowed the pair to join his team of sled dogs, who initially bullied the White House pets for their pampered backgrounds. Later, sources stated, Sunny and Bo earned the respect of that same dog when they worked together to save several members of the sled team who had fallen through a patch of thin ice during a routine supply run. Unbeknownst to the pair as they made their way across the country, the Obamas were said to be desperately trying to locate the pets they missed so much. According to sources, Sasha and Malia Obama put up flyers all around the nation’s capital and asked every congressman they encountered to keep an eye out for the dogs in their home districts. Reports indicate that Sasha also went to bed each night looking at an old photo of her beloved pets, promising aloud that they would all be reunited one day. As the first dogs passed through the Midwest on their trek homeward, they reportedly came upon a small city where, much to their delight, they heard the unmistakable sound of their owner’s voice. Barking excitedly as they ran toward it, they are believed to have rounded a corner only to discover President Obama giving a speech on the screen of a television in an electronics store. Reports confirmed the pair, having caused quite a commotion, were then chased down the block by the town’s dogcatcher, escaping only after Bo bit the man on the seat of his pants, causing him to yelp in pain and exposing his heart-patterned boxer shorts to passersby beneath the flap of torn fabric. Some days later, Sunny and Bo appeared ready to give up, having convinced themselves they would never again sniff fresh tomatoes from Michelle Obama’s vegetable garden or receive one of Treasury Secretary Jack Lew’s signature belly rubs. Deciding they were simply too tired and demoralized to continue onward, the pair are said to have stopped to sleep for the night in the bed of a beat-up, old pickup truck. Sources said they were jarred awake in the morning when the engine roared to life and the pickup lurched out onto the highway. After initially panicking when they realized they were being driven to an unknown destination, the two dogs reportedly soon found themselves enjoying the breeze rushing through their fur and the vast stretches of ground they were quickly covering. Several hours later, the dogs are said to have smelled something familiar, perking their heads up over the tailgate and then howling in delight when they saw trees filled with pink cherry blossoms growing denser around them. At press time, Michelle Obama was reportedly rolling her eyes and saying “I guess everything’s back to normal” as the family sat down for their first meal together since their reunion and heard the unmistakable sound of Bo lapping water from an East Wing toilet.